BOTANY provides a relaxed atmosphere for hands-on workshops that are fun, personalized, and inspiring. All of the workshops use a profusion of beautiful seasonal flowers and plants with a focus on using an unusual mix of materials and an organic style. All materials are included in the session and everyone leaves with their fabulous creation! We will be hosting a series of pop up workshops at AGENDA CAFÉ, just a stone's throw from our studio on College Street. The workshops focus on an easy going approach to floristry and will include our various workshop themes. Join our Mailing List, where we will announce the dates and workshop titles as they are scheduled throughout the year. To register in a workshop, Contact Us or or simply book and pay for your spot in one of the workshops listed below. Pre-payment of each spot is required. Each workshop spot is non-refundable. Register early, as limited spaces are available in each workshop. We accommodate private workshops for corporate parties, product launches, birthdays, and bridal showers. Contact Us for rates and information. Gift Certificates are available to gift for use towards a workshop. The OG of wearing blossoms in your hair. Wearing pretty flowers in your hair makes for some serious #HairGoals — gotta get those likes! Plus, the scent alone will make it worth it. 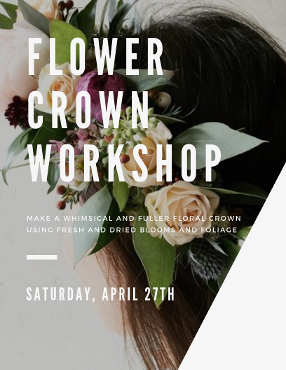 In this hands-on workshop, all materials will be supplied and instruction will be given to make a whimsical and fuller floral crown using fresh and dried blooms and foliage. Ever notice that entrancing smell of spring? The earth is awakening and it does indeed smell more, well, sweet. Learn the bouquet as high art using the European "twist" technique. 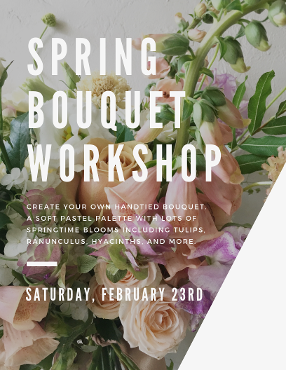 A designer will guide you with a demonstration showing how to construct sophisticated and interesting colour and floral combinations in creating your own handtied bouquet. We'll be focussing on a soft pastel palette with lots of springtime blooms including tulips, ranunculus, hyacinths, and more. Plants make us feel happier, calmer, more productive and more relaxed. 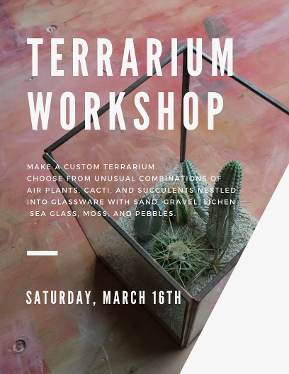 #plantsmakepeoplehappy In this hands-on workshop, all planting materials and plants will be supplied and instruction will be given to make a custom terrarium. Choose from unusual combinations of air plants, cacti, and succulents nestled into glassware with sand, gravel, lichen, sea glass, moss, and pebbles. We're mixing art with floral - get in on this fun! 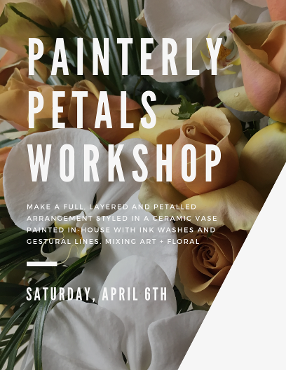 In this hands-on workshop, all materials will be supplied and instruction will be given to make a full, layered and petalled arrangement styled in a ceramic vase painted in-house at Botany Floral Studio. The ceramic vases are each unique and hand painted in ink washes and gestural lines. Materials include a seasonal selection of premium blooms and we'll be focussing on a colour palette of oxide, white, raw sienna, and taupe to compliment the painted ceramic. Premium blooms include Quicksand and Golden Mustard roses, phalaenopsis orchids, spray roses, and our signature in-house dyed taupe carnations. Check back with us on Instagram, as we'll be posting pictures of us painting your ceramics in preparation for this workshop! A type of bonsai, plants are fashioned into these fascinating exposed earth orbs, called kokedama, which can be placed in groupings in shallow vessels or suspended using string. 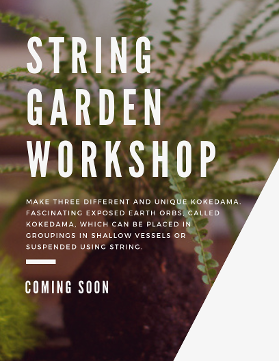 In this hands-on workshop, all planting materials and plants will be supplied and instruction will be given to make three different and unique kokedama. Interested in taking a workshop? Workshops are offered as the seasons change. Sign up to our mailing list and we'll email up-to-date workshop schedules to you.